I took a few months off from brewing this summer to travel (VT / CA) and work my way through some of my cellar and homebrew back log. With any layoff it takes a bit of motivation to get started again. It’s not that I don’t want to brew, it’s just that life is busy these days. I figured my first batch back I should make something I’m comfortable with, so I made my third batch of bitter american clone. If you recall this was the first all grain beer I brewed and I brewed a second larger batch focusing on local ingredients for my club to bring to NHC back in 2013. 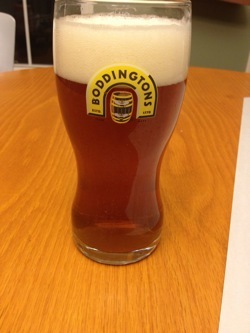 I’m familiar with the recipe, but wouldn’t say I have brewed it enough to have it mastered. The original recipe came from a brew your own article on canned craft beers. When planning to brew this, I focused on using the ingredients i had on hand. I’ve got an over stocked freezer full of hops, and a cellar full of grain just waiting for me to brew. Somewhere along the way, I neglected to reference the original recipe and just used pearl malt instead of the recipe’s golden promise which I do have on hand. These two malts are similar, but from reading comparisons, http://www.homebrewtalk.com/f12/2-row-vs-maris-otter-vs-golden-promise-vs-halcyon-vs-pearl-vs-optic-439642/ they aren’t the same. I’m annoyed since I picked the golden promise up with this recipe in mind, and used a chunk of my remaining pearl. The other change in the recipe was to swap out the warrior bittering hops for citra. I’m not sure why I haven’t bought more Warrior, I liked it in the alpha king clone, but more high alpha hops won’t be added to my freezer any time soon. This is the first time in a while at home during daylight hours, something I should do more often. 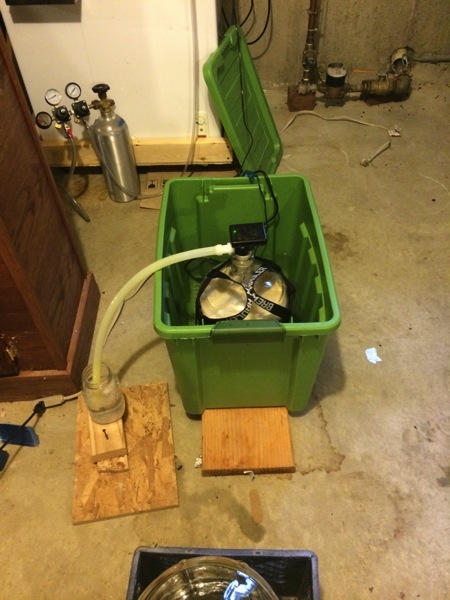 I prepared my my gear up the night before and I was brewing early morning on a Saturday. Prior to the brew day I reworked my chiller using copper wire and silicone high temp hose to make it more stable, and round again. However, I forgot to check this for size, before doing so, and it no longer fits into my my small brew pot with the thermometer Probe. I was stumped for a bit, but then realized I could pull the thermometer and installed a plug instead, good to go. 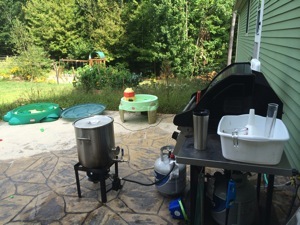 I think I’ve forgotten all the lessons I learned from brewing the daisy cutter clone back to back to back. Once again my volumes are all over the place, and I managed to forget to put the Biab bag I’ve been lining my mash tun. I did hit my mash temp in spots, but I’m not sure how to really even it out without crazy amounts of stirring which will drop temps. I’m also not sure why my runoff is so cloudy, I vorlaufed as usual. With such a small grain bill, it’s pretty low in the cooler, and I’m pouring the sparge and vorlauf from a fairly high distance disturbing the bed. Maybe it’s my crush, which I think is a bit floury. Perhaps I need to adjust my mill. Too many ideas of how I should fix it. It would be real nice to recirculate to get clear wort during mash #dreams. My post boil gravity was high, as I’m still tuning my strike and batch sparge volumes, eventually I’ll figure this out. 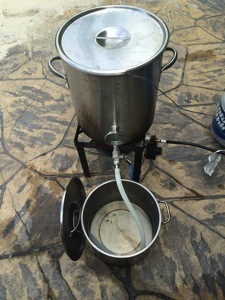 Despite my hard boil, and rapid immersion chilling I didn’t get clear runoff. Maybe I need to alter whirlpool steps, try to whirlpool, and leave the wort alone during chilling. Which seems inefficient and wasteful of water, maybe I can devise a recirculating ice water bath to use after initial chilling. 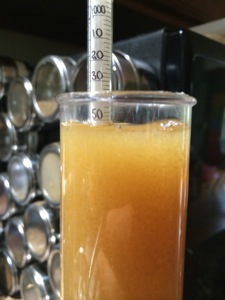 My gravity of 1.052 post boil accounts for the lower than expected volume, I only gathered 2.5g. I’d made a starter from a can of Heady Topper, starting with 500ml, and boosting to 1250ml starter. The first step took a few days for it to get going, but after the second step of the starter it was rocking. The beer took off pretty quickly, and finished in less than a week. I dry hopped in primary, which will strip some of the dry hop impact, but I feel that unless you are going to repitch, just up your dry hop amount, and benefit from one less transfer of your beer, and less 02 exposure. I really like how this beer has come out both times i’ve made small batches, but I just can’t leave well enough alone. Bitter American Clone Review Bitter American Clone Brewing Bitter New Englander for NHC’s club night. Daisy Cutter Clone Review Taking a second chop at the daisy cutter.